Even after toppling – or allying with – the Eternal Emperor and his twisted family, the galaxy still faces threats. You may sit upon the Eternal Throne, but there’s no rest for the weary, no matter how comfortable the chair. The War for Iokath has begun. The next update for Star Wars: The Old Republic takes players to Iokath, an artificially constructed planet akin to a Dyson Sphere. It’s inhabited by machines and sports a superweapon capable of unimaginable destruction. No, really, imagine some destruction. Got it? Well, that’s not enough. Naturally, both the Republic and the Sith want this superweapon. They’ll fight over it, and your character will be at the heart of the action – though the side the Outlander supports may not be the one he or she is used to representing. 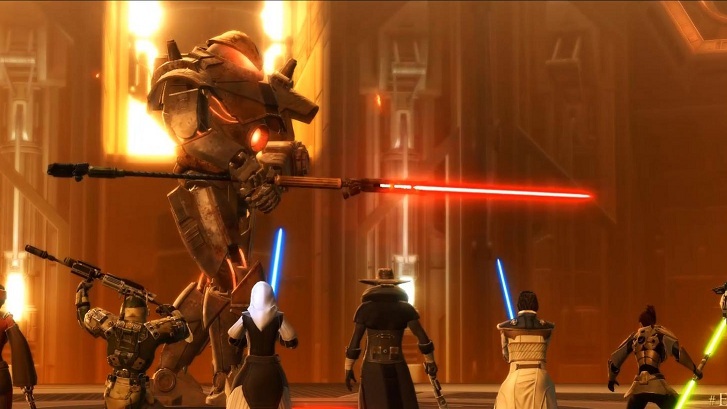 “When players started in The Old Republic, they chose between being Republic or Empire,” said Creative Director Charles Boyd in a group interview last week. “But now, they’ve become this powerful figure, and they may see their allegiances shifting.” When you participate in PvP on Iokath, you’ll be able to choose which side to fight for, regardless of your character’s original leanings. So your Republic Trooper might fight for the Empire while your Sith Inquisitor could fight for the Republic. While limited to Iokath and not a full “alignment swap,” it’s a fun option for players who’ve gone with an alignment opposite of what’s expected of their faction. 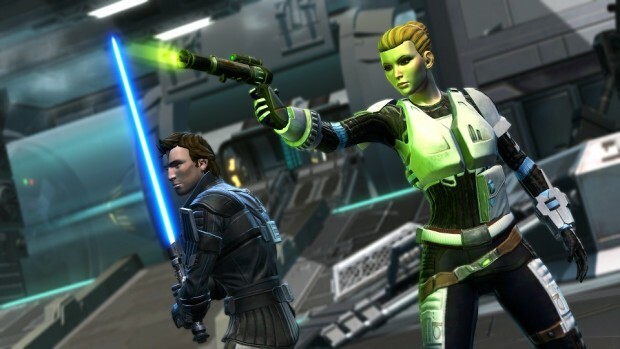 Both PvP and PvE on Iokath will have a number of shifting objectives, with all sorts of new toys to play with, including Walkers and Mouse Droids. As you build up your reputation with the Republic or Empire by doing missions for that side, you’ll unlock various rewards. Don’t worry, you’re not locked in to one side or the other; every day, you can select a different set of aligned missions to “play for the other team” if you desire. But the biggest news coming with War for Iokath is the addition of a new operation, the first that SWTOR has seen in years. 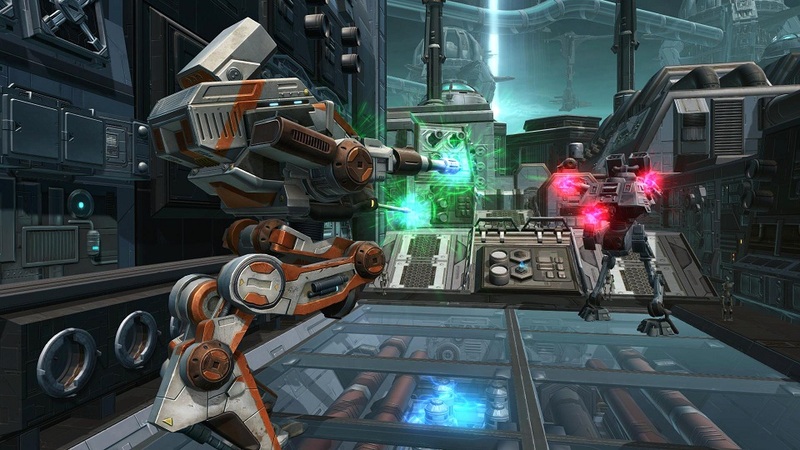 Gods from the Machine sends you to the beating, robotic heart of Iokath to take on its mythic, almost god-like, creations. The first wing and boss, Tyth, will be unlocked with this update, with the other four to follow throughout the year. Known as the “God of Rage,” Tyth is a giant lightsaber-wielding droid whose powerful attacks can knock players off the small platform where you do battle with him. He also covers the ground with AoE fields, leaving very little in the way of safe places to stand. No Star Wars: The Old Republic interview would be complete without asking about everybody’s favorite new-ish feature: the Galactic Command system. I asked Boyd what changes were in the works, as public sentiment – at least from what I can see – is still leaning toward the negative. Players might be aware of the recent event that boosted Galactic Command XP by a factor of 3.5. In Update 5.2, BioWare is looking to increase the rate of CXP gain by roughly that same amount, through CXP drops from enemies and an increased base rate. It won’t be exactly 3.5, but the overall progress is expected to roughly match that factor. The loot drops from Command Crates will also be improved, especially at higher levels, and there will be fewer duplicates. But the biggest update will be the addition of a new tier of gear, tier four, dropping for players at Galactic Command Rank 300 every time they level up. It all adds up to a meaty chunk of content that’s meant to appeal to players in all stages of SWTOR fandom, from casual daily-grinders to top-tier raiders. Our thanks to BioWare and Charles Boyd for taking the time to show and talk to us about all the new stuff!